What's new in PaintCode 3? Finally, the droid you have been looking for! 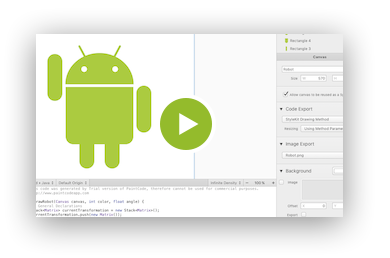 Use PaintCode to turn your drawings into easy-to-use Android Java code. Perfect for drawing icons and custom UI elements. You can even make your drawings animated or parametric. PaintCode 3 adds support for Swift 4.0 and Swift 3.0, fully compatible with Xcode 9, iOS 11, and macOS Sierra. By carefully analyzing the Swift compiler and tailoring the generated code to it, we were able to improve the compilation speed by more than 150x in many common cases. See the tutorial video to learn more. All generated drawing methods now take 2 parameters - the target rectangle into which you wish to draw and the resizing behavior. 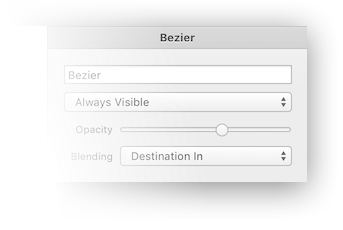 You can choose between ‘aspect fit’, ‘center’, ‘aspect fill’ and ‘stretch’ resizing behaviors. 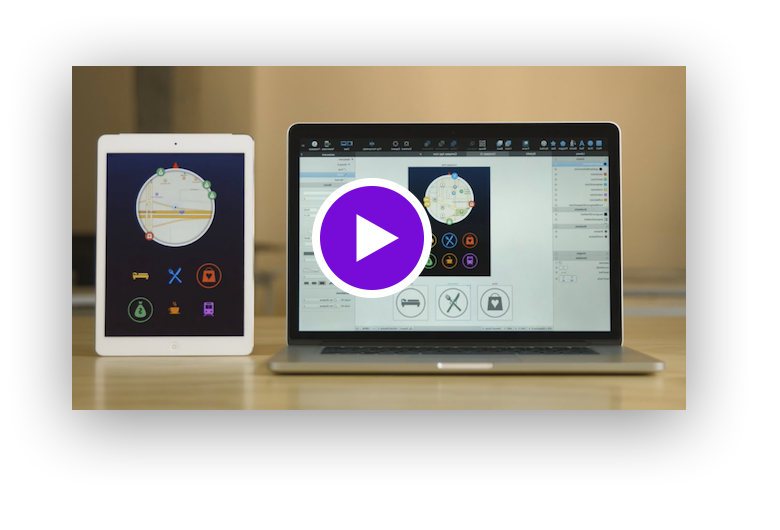 Imagine you could redesign your app in real time, while the app is actually running on a real device. Press Command+P to show the Preview window. When you work on some small detail in your drawing, you can set the Preview window to show you the big picture. 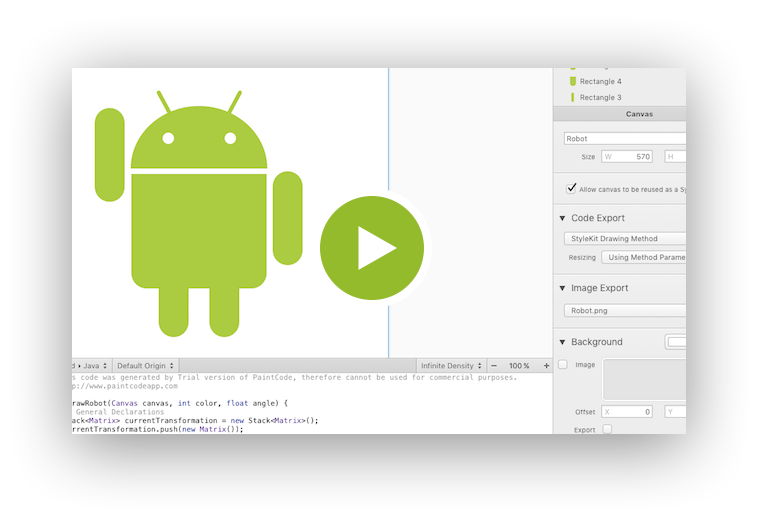 With our new QuickLook plugin, you can quickly peek into your PaintCode documents without launching the app. You can even preview multiple canvases from your document. Use the Inspector set the opacity and blend mode for every shape. 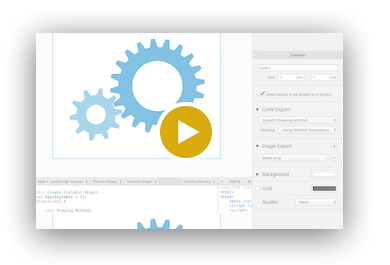 Some drawing apps produce SVG documents that make heavy use of CSS. Importing these documents now works much better. We've also improved blend mode compatibility, both for imported and exported SVG documents. New functions for use in Expressions: log(x), log2(x), log10(x), pow(x,y). Uses SF UI font to render macOS and iOS system fonts. Uses SF Mono font for generated code and expressions, if installed. Fonts that are not installed are preserved when opening documents. Live preview of font selection from popup menu using Shift key. Ability to quickly convert selection to a Symbol. 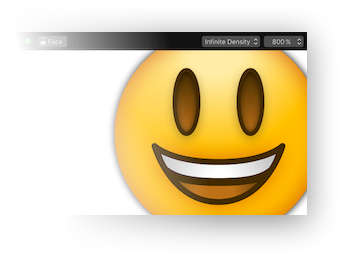 Ability to preview canvas as icon in the macOS Dock. 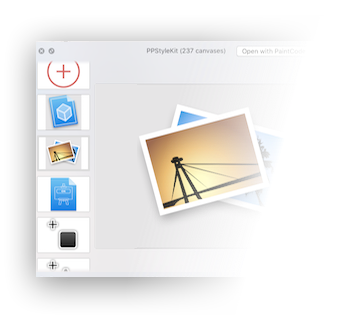 If you bought PaintCode 2 after June 1st, 2016, you are eligible for a free upgrade. Please contact us at support@pixelcut.com.